Orikum can be seen in the far left. In the foreground there is an old military naval base presently manned by a few NATO troops. 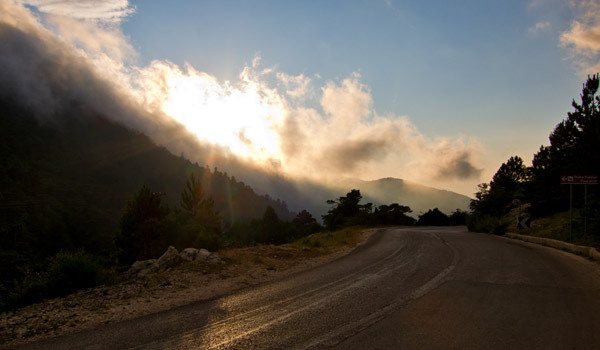 Driving along the coastal road from Orikum to Dhermi you will pass through the famous Llogara Pass, a spectacular winding road, rising up to 1,027m and overlooking the Ionian coast of the Albanian Riviera. This is the highest point on the main coastal road between Vlore and Sarande. The first road over Llogara Pass was built in 1920 but until as recently as 2009 the road from Llogara to Sarande was very narrow, almost single lane, partially a dirty road or a raod with an old dilapidated coating. Llogara Pass (Qafa e Llogarasë – in Albanian) sits at the height of 1027m and is nestled in the middle of the Çika Mountain range which is part of the Llogara National Park. The Çika Mountain range starts at the Karaburun peninsula, and as it’s running south it’s becoming taller and taller. 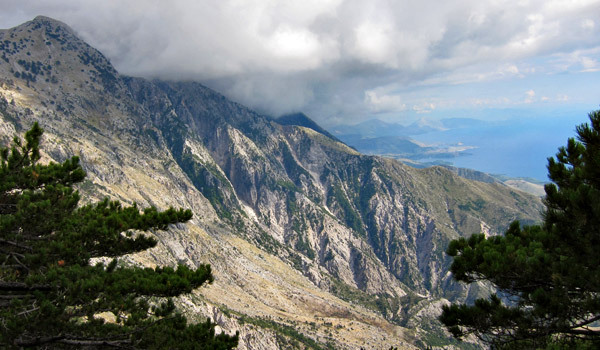 The top peak – Çika reaches 2,044 meters elevation, and it stands a little south of Llogara Pass. This mountain range runs almost for the whole length of the Ionian coast until the city of Sarande. The Llogara Pass divides the mountains into a western and an eastern range. The western chain are also known as Acroceraunian Mountains. In some places the mountains fall directly into the sea. The Mountains have been remarked upon already by ancient authors such as Ptolemy, Strabo and Pausanias. In 48 BC during Roman Civil War, Julius Caesar landed with his legions at the nearby beach of Palase. He soon crossed the mountains over at Llogara Pass in a place later named as Caesar’s Pass to chase his adversary Pompey. For centuries, this spectacular mountain range has almost completely isolated this part of the coast from the rest of the country. That’s why the local inhabitants had easier connections by sea with Corfu and Greece than by land with inland Albania. On top of the Llogara Pass, you can find some free parking space and a few decent restaurants overlooking the truly magnificent scenery. Looking down from the Pass to the south along the coast you can admire the white beaches of Ionian sea and the village of Dhermi. This part of the country is renowned for the best climate in the whole Albania. The average January temperature is up to 10 degrees, and the average July temperature equals to 25 degrees. The region has about 300 sunny days a year. The beach of Palase, is the first beach, south of the Llogara Pass. The 1.5 km long beach is used as a landing place by sky divers, parachuting down from the Pass. It is an impressive sight down there from the beach – the mountain starts at sea level and you can see the road winding its way up – until you lose it in the clouds. This part of the region is characterized by traditional Mediterranean villages, as well as various historic castles and Orthodox churches. Not surprisingly, the scenery varies between mountain passes, white beaches, hidden caves, marine fauna, and citrus and olive plantations. Albanian Riviera gained international attention following the reconstruction of the coastal road in 2009, DJ Tiesto ‘s concert stop in Dhermi , and the shooting of a Top Gear episode showing a breath-taking car pursuit along the winding coastal road. The Albanian Riviera was declared as the Top Value Destination in 2012 by Frommer’s. Llogara National Park situated nearly 30 km southeast of Vlore on the main road between Orikum and Dhermi, has been declared by the Albanian Government as a national park in 1966. The Park area can be used for hiking and as an alpine retreat. Some small tourist resorts are located here. The 1,010 hectares area is covered by lush plant life and considered a classic place where a natural equilibrium exists between the world of animals and plants. The Park is known from its vibrant flora and fauna with over 100 different types of wild animals and birds including: deer, wild cats, foxes, etc. The mixture of refreshing high altitude mountain air and proximity of the sea makes it very attractive destination for tourists. The area is also important for the growth of eco-tourism, picnic, hiking and air sports. 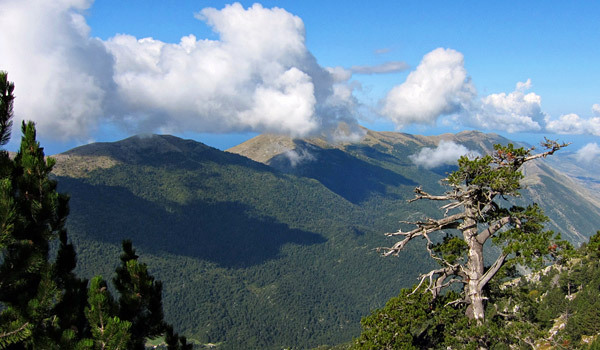 The visitors to the Llogara National Park have the opportunity to see beautifully-shaped trees, formed by air currents, or to admire beautiful views of the Ionian Sea. One of the important tourist attractions is the Flag Pine tree which resembles the Albanian Eagle. Want to find out the cost of the parachute um from Llogara to Dhermi ..!! Could someone please get in touch and advise what the cost and implications are ?